Bright and charming apartment in the city centre. The apartment is located in the rear building, so there is no noise from the street. Two bedrooms with sleeping arrangments for 2 people. This location is your entrance to Copenhagen. 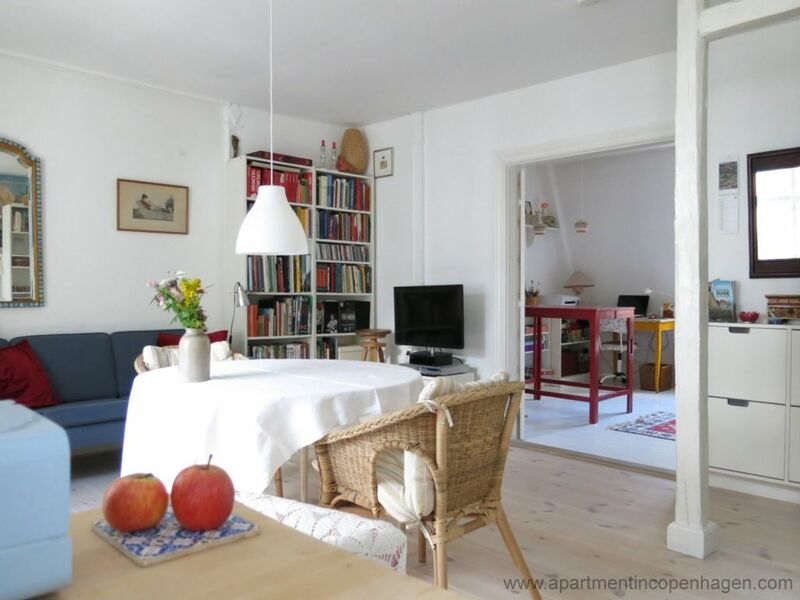 The Royal Theatre, Amailienborg, Nyhavn and Strøget are all very close, so if you want to experience Copenhagen on foot, this apartment is perfect. Even though this apartment is located within the city centre and only five minutes of walk to the pedestrian zones, the area is calm and quiet. Cosy apartment in a building from the 18th century, so you can really sense the presence of history at this location. Hall, combined kitchen and sitting room, bedroom with single bed, bedroom with double bed and direct access to the bathroom, i.e. you have to pass through the bedroom to get to the bathroom. Wi-Fi, TV with a limited selection of channels, DVD, stereo and access to the building’s laundry room. The apartment is located on the second floor in a building without lift. Great apartment. Close to the city centre but really quiet. Well-located, bright and sunny, if a bit basic. The apartment is located conveniently for sightseeing. It is quiet as it is in a courtyard off the street. The Metro is a 10 minute walk and there are buses on the street outside the building. Access to the only bathroom was through one of the bedrooms but it wasnt really a problem. We were surprised that the linens had been piled on the beds without actually being put on. When we queried this, we were told that it was to prove that the linens were clean. When we made our own beds, we discovered there weren't enough linens. This was corrected the next day. The kitchen had sufficient implements and dishes. Firstly a big thank you to everyone at 'Apartment in Copenhagen', we made a 'little' mistake on our arrival but they looked after us with great humour and kept checking everything was OK (and it was). The apartment has lots of character and felt very homely. It is in a nice quiet area and building. It is located a short walk from Nyhavn, city centre, cafe's, restaurants, royal palace, harbour, the little mermaid, the unique Kastellet and parks. The whole area is flat and easy to walk around. Bicycles dominate the cars which makes a refreshing change. The locals are extremely nice and helpful. If we could we would return tomorrow. Lovely bright apartment, in a historic building within walking distance of many of the tourist attractions. The apartment was very well equipped and we really felt it was a 'home from home'. It made all the difference coming back to such a lovely place after a busy day. It was great to read about the history of the apartment block in the welcome pack. Sehr sauber und gemütlich! Optimale Lage. Alles problemlos. Jederzeit wieder.